June 4, 2013, 10 a.m. The executive director of J-Lab says it’s time for news to move from a commodity to a catalyst for empowering citizens. By Jan Schaffer @janjlab June 4, 2013, 10 a.m.
Four years ago, UrbanMilwaukee.com zeroed in on South 2nd Street, a pocked roadway in the city’s Walker’s Point section that seemed “ripe for improvement,” said site co-founder David Reid. The local community weighed in with ideas, then graphic artist Kieran Sweeney sketched a possible redesign. It included, trees and access for pedestrians and bikers as well as cars. His sketch was entered in a livable-streets competition, and it took second place. That was just the news peg traditional Milwaukee news outlets needed to publish the images. Before long, a local alderman got on board and the idea of a redesign got put on the public works agenda. Two years later, the community cut the ribbon on — voila — its new streetscape. This example (from J-Lab’s “Engaging Audiences” report) and many more struck me as I listened on Friday to a panel at the Ashoka Future Forum wrestle with ideas on how to move news from a commodity to a catalyst for empowering citizens. 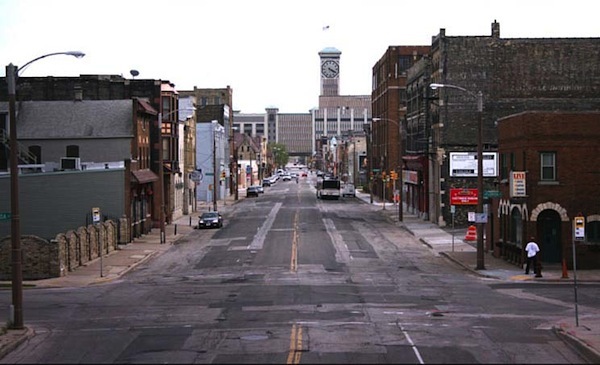 From 2009: A photo of South 2nd Street in Milwaukee (top) and a concept image by Kieran Sweeney. “We’re seeking to go from knowledge to movement,” said Jonathan Wells, managing publisher of the Christian Science Monitor, which is crafting a survival strategy that involves more than just going all-digital. “In five years, the Monitor will be building communities around intention and intentionality,” he said. If one shifts the periscope from new business models for journalism to new journalism models for news, I see the convergence of several trends that are beginning to provoke a new conversation about whether journalists can — and should — craft a more deliberate suite of tools that inspire movement and action. And if these tools were effective, would citizen begin to pay as much for news as they pay to go to, say, a TED conference? To be sure, advocacy is still a dirty word for legacy journalists, unless it’s an editorial-board crusade. But activating examples are rising from both inside and outside mainstream media. 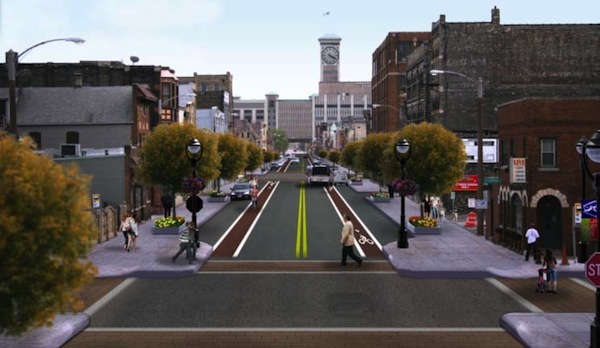 In addition to its before-and-after streets visualization, Urban Milwaukee, for one, has also invited readers to plot new trolley routes. Several news outlets have employed budget calculators, news games, and clickable maps to give news consumers a way to wrestle with public choices. They usually fall short, however, of becoming actual change agents. My colleague Matt Nesbit has chronicled the rise of “knowledge journalists,” such as Bill McKibben, who use their expert logic to analyze problems and political logic to help point to policy solutions. Now we see the return of “solutions journalism,” a notably successful tool in the civic and public journalism toolbox of more than a decade ago. “Society will become better when you show it where it’s going wrong and how it can be done better,” he said. Bornstein advocates doing deep dives on “positive deviance.” Rather than focusing on failures, journalists can pull out the contrarian success stories in data sets and unpack the elements of their success. From my perch, I see many indie news startups embrace what I call more of a “soft-advocacy” comfort level with news. ClearHealthCosts.com is partnering with WNYC to map widely disparate costs of mammograms in the New York region. PlanPhilly has not only spotlighted the enormous problem of delinquent property taxes in Philadelphia, it reported on how the city might fix its broken system. When Catalyst Chicago reported there were too many empty seats in the city’s pre-school programs, it didn’t stop there. It worked with local community organizations to produce a series of forums on early childhood education. A year later, nearly all the pre-school slots were filled. There may be much to learn from how TED has evolved. Initially, its talks spotlighted speakers at luxury conferences who had ideas worth spreading. But TED Media executive producer June Cohen told the Ashoka group that in an effort to spread the good ideas, she invited interest from television networks. When they got no takers, they videotaped the talks and put them online. Her thinking aligns with the Christian Science Monitor’s Wells, who sees the relationships changing significantly between the news organization and its consumers and advertisers. “People are looking for a sense of empowerment and an ability to take action,” he said. Jan Schaffer is executive director of J-Lab, a journalism catalyst for igniting news ideas that work by funding pilot projects, awarding innovations and sharing practical insights from years of working with news creators. J-Lab is based at American University’s School of Communication. POSTED June 4, 2013, 10 a.m.
Schaffer, Jan. "A new kind of activist journalism: When finding solutions are part of journalists’ job, too." Nieman Journalism Lab. Nieman Foundation for Journalism at Harvard, 4 Jun. 2013. Web. 24 Apr. 2019. Schaffer, Jan. "A new kind of activist journalism: When finding solutions are part of journalists’ job, too." Nieman Journalism Lab. Last modified June 4, 2013. Accessed April 24, 2019. https://www.niemanlab.org/2013/06/a-new-kind-of-activist-journalism-when-finding-solutions-are-part-of-journalists-job-too/.